This superb, large-scale Cinematic Quality 3D virtual reality immersive visualization system is the most immersive VR system on the market, providing an unparalleled level of fidelity. 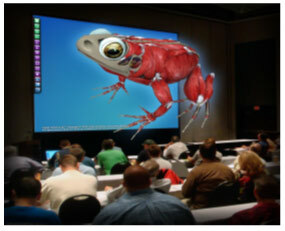 It is a free standing turnkey system for the ultimate immersion of up to 300 people. The system is a large-scale structure, designed to be around 20ft x 13ft (6m x 4m). The quality of immersion is very high. This system will allow up to 300 people to be immersed and will allow for one person to directly interact with the holographic objects that will float in front of the screen larger than life. A control center where all computers, image generators, video capturing device, and sound system control are installed. Using a dual passive 3D stereoscopic system emitting over 10,000 lumens of light, the system is unsurpassed. The system provides an amazing view of the human body, fully dissectible, both male and female anatomy, and with the most medically accurate 3D representation. The “WoW” factor of this environment is very significant. -	High end 3D immersive solution as a permanent installation for a high impact demonstration or visits by high-end officials, in addition to immersing students in the virtual world to learn anatomy at the highest level. -	Active 3D stereoscopic design providing the highest level of professional stereo. -	Maximum perception of depth and maximum immersion into the virtual world. Cyber Anatomy Med VR (and Cyber Science 3D) advanced visualization software installed and calibrated for the screen size and projector requirements. Rear projection, meaning projector will be installed in the back of the screen, above the level of the screen. Head room is required (see ceiling height).